There is a good deal of controversy and debate still surrounding the question of whether or not technology can make a difference in the educational process. At EmergingEdTech, we’d like to approach this from a slightly different angle, changing the question from “Can technology make a difference in education?” to the more focused question, “Which technologies can make the biggest difference in education?”. Towards that end, we are seeking input from our readers. 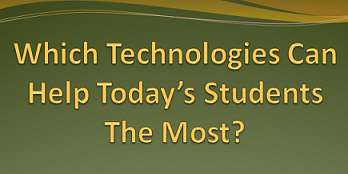 EmergingEdTech will put together a survey to gather and organize educator’s perspectives on which of the endless array of technologies available to today’s educational institutions can really make a difference in the quality of education and the way students learn. We figured a good way to start is to first reach out and gather some initial feedback, so we can be sure to list all of the most meaningful, relevant technologies in the survey. Please CLICK HERE to read the full post and share your thoughts on this at EmergingEdTech.com. Thanks! !